Time for a look at the Berkeley Bears. Coming off a nine-win ’08 season that saw some major ups, including an Emerald Bowl victory over Miami, still something was, oh, I don’t know, missing. Maybe it’s because of the talent that Cal rolls out every week, which rivals only USC and Oregon for tops in the conference? Maybe it’s the super-genius tag applied to Jeff Tedford and his staff’s ability to recruit with the big boys, year after year? It’s hard to figure out. The reality is that Cal is, quite simply, an upper-echelon program under Tedford. They’ve won at least seven games every year since 2002, including 10 wins in ’02 and ’06. Tedford hasn’t disappointed in bowl games either, now 5-1 in the postseason in his time at Cal. But while bowl games (and wins) are nice, still, you add it all up and there is one major thing left on the to-do list – a BCS bowl in the Tedford regime. 2008: 9-4, 6-3 in the PAC-10. Started out pretty good, but hit some snags in early November, losing back-to-back games at USC and Oregon State. At 6-4, there were worries that Cal might be headed for a bit of a 2007 relapse, where the team folded up the tents after running into some mid-season adversity. But Cal rallied, winning their last three games, including the Emerald Bowl, to post a very respectable nine wins. FANS ARE: Pretty pleased with where things are. They haven’t yet had a losing season with the current regime, and Tedford has built a top-shelf program. Outside of their 7-6 struggle of ’07, Cal is always rated right there with Oregon as the top threats to USC, yet still looking up with the rest of the world at the Trojans. But the fans are also ready for a BCS bowl. To keep things going in a great direction, a New Years day appearance would go a long way towards shortening the gap even more between themselves and the men of Troy. OFFENSIVE SYSTEM: Basically a pro-set with a fullback and tight-end, but a lot of different formations and looks. Cal might be a bit hot-n-cold in the passing game on a yearly basis, but their staples are always a strong, deep running game spearheaded by excellent offensive line play. While o-line coach/offensive assistant Jim Michalczik has moved on to UW, and then the NFL’s Oakland Raiders, things should still be business as usual. Let’s face it, the offense is Tedford’s baby, and regardless of coaching titles and such, it will remain his stamp on the program for as long as he resides in Berkeley. ’08 OFFENSIVE RATINGS: 4th in the PAC-10 in scoring (32.6 ppg), 5th in total offense, and 4th in rushing offense. Not as great as many felt they would be early in ’08, but still, pretty impressive. The downside was the passing offense, just 7th in the league with 189.8 yards per game. ’09 RETURNING OFFENSIVE STARTERS: 7, including top backs Jahvid Best and Share Vareen, and QB Kevin Riley. He finished the year on fire, including an amazing 311 yards rushing against the hapless Washington rushing defense. But it wasn’t just UW who he skewered down the stretch. Best would total 698 rushing yards in his last three games. A decent receiving threat with 246 yards receiving, Best was number two in the country in total yards per game. Oh yeah, he also had seven runs of at least 60 yards last year, including three that went for 80+. The man just defines explosive. Now, the bad news – health. 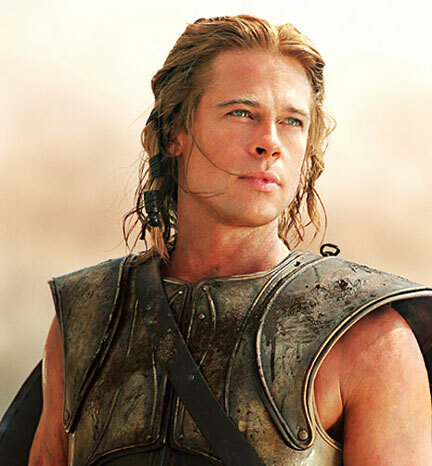 I liken Best to Achilles. You know, just a fabulous specimen capable of pretty much anything you can conceive, yet he has that one soft spot on the heel that can bring him down. And health has not been Best’s buddy, with various ailments over the last couple of years that have somewhat kept him in check. Best missed spring ball with foot and elbow surgeries, but he should be ready to roll in August. A healthy Best could be the difference between the likes of the Emerald Bowl or something much, much bigger in ’09. DEFENSIVE SCHEME: A tricky defense led by former Coug Bob Gregory, Cal throws tons of different looks at you. Most likely you’ll see a lot of 3-man fronts, with zone blitzing, etc. ’08 DEFENSIVE RATINGS: #2 in the PAC-10 in scoring defense, 4th in total defense, 3rd in rushing defense, and 5th in passing yards per game allowed. They were #3 in sacks with 35, and led the conference with an impressive 24 interceptions. An aggressive, upper-division defense. ’09 RETURNING DEFENSIVE STARTERS: An impressive 8 starters return from last year’s defense. Thompson had a big year in ’08, with 70 tackles, 7.5 for loss, and a team-high four interceptions. But the best part is that Thompson will have plenty of help next season. The entire starting secondary is back, so you have to believe they’ll continue their ball-hawking ways in ’09. 1) Can the defense overcome the loss of the big-time linebackers in Follett, Williams and Felder? Normally this would be a big concern, but maybe not so much for Cal. Why? Well, for one, they are super-deep at defensive line. Literally everyone is back up front, and that will be a huge boost to keeping the linebackers free to flow to the ball and make plays. As many people know, the linebackers on any defense are often only as good as the talent in front of them. If you have push-over defensive linemen, then the opposing offensive linemen can get out and put their hats on the linebackers. But if you have strength up front, the linebackers can do what they do best – run and hit. And while they will have three new faces at linebacker, they might not be in a better situation to break in as starters than what they have up front coming into ’09. 2) Is Kevin Riley going to take a big step forward this year? 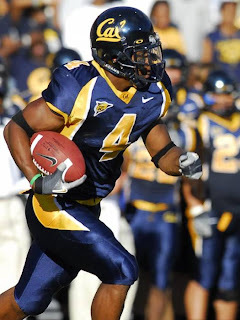 Or is he the true “Achilles heel” for Cal’s ’09 season? Riley was, to be fair, inconsistent in ’08. He averaged just 123.6 yards passing per game last year, which is not exactly top-notch. He took care of the ball, throwing 14 TD’s with six int’s. But even with that strong running game and an outstanding offensive line, he still completed barely more than 50% of his passes. Needless to say, but that isn’t getting the job done. Riley also shared the job with Nate Longshore, but Longshore has now graduated. Besides, it can be hard to get a strong feel on how a QB will do when he isn’t looking over his shoulder every time he throws an incomplete pass? But even with Longshore out of the way, there is some uncertainty surrounding the QB spot coming into the season. There wasn’t a ton of ringing endorsements for Riley coming out of spring. And there are some younger QB’s who will push him, with the huge sophomore Brock Mansion and talented redshirt frosh Beau Sweenety. So like it or not, it is sink-or-swim time for Riley. 3) What is with the schedule? They open with Maryland at home, which is a game they will probably be favored to win, revenge-style from last year’s thrashing in the Terps’ backyard. After hosting Eastern WA in a likely “stat game”, they face a tough stretch, where they’ll go to Minnesota and at Oregon, in a game that could go a long way towards the PAC-10 title. And that game at Minnesota might be tricky. You know, changing a few time zones and facing an opponent they might not take too seriously with Oregon looming the following week? You think about what happened to Cal at Maryland last year (35-27 loss) and you have to wonder a little bit. But after Oregon, they open up October with the biggie, a home showdown with USC. All told, Cal has five PAC-10 road games, so it could be a tough road to the top. WSU FOOTBALL BLOG SEZ: Earlier this spring I wasn’t so sure about Cal. Maybe it was the loss of the top linebackers, or the fact that Riley at QB wasn’t a sure thing. But after looking at them deeper, they look good. REALLY good. While they lost some really good offensive linemen, and their top play-making linebackers, they still have a ton coming back on both sides of the ball. In fact, it could be said that of the likely top three in USC, Cal and Oregon, Cal has the most coming back for next year. That stretch of at Oregon and then hosting USC in back-to-back games is rough, but will be a huge two-week stretch in deciding who takes the PAC-10. After that October 3rd game with USC, if things go according to plan, Cal should be favored in every game the rest of the season (yes, I’m including the 10/24 game where they host WSU!). I’m not exactly picking Cal to win this thing….at least not today. But if there IS going to be a year where USC fails to win the title for the first time since ’02, this could be the team that does it. You could call this “second in a series” as we look ahead to our ’08 opponents. 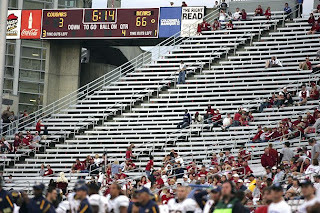 Last Sunday was Okie State, and today, we examine the Berkeley Bears and their post-spring condition. What does that mean, actually? Well, a check of the current roster, and you understand. Cal’s heroes have left the building. Super-speedy Mr. wonderful, DeSean Jackson? Gone. Leading receiver (better numbers than Jackson, actually), Lavelle Hawkins? See ya. WR Robert Jordan and his 689 yards receiving? Adios. Strong all-around TE, Craig Stevens?? BUH-BYE. In fact, the top 5 receivers from Cal’s 2007 team are “pursuing other interests”. Oh yeah, sprinkled into the conversation is that leading rusher Justin Forsett and leading tackler Thomas DeCoud have both moved on. Forsett is now with the Seattle Seahawks. Forsett had an outstanding 1546 yards rushing last year, and a team-high 15 rushing TD’s. DeCoud had 116 tackles. Both will be missed. That’s a true frosh folks. There’s a reason they call him “The Jet”. He’s a home run threat every time he touches the football. HOWEVER, he did only get 29 carries for the entire 2007 season, so he’s not real experienced. He’s cut, but only 5-10, 185. This isn’t an Adrian Peterson, 25-carry per game body type here. The load might be tough as the feature guy. And as far as health goes, there is already cause for concern. Best missed a good chunk of spring ball, out nursing a hip injury. As ESPN’s Ted Miller wrote, it’s the type of hip injury that makes coaches nervous. Best is sort of like that suped-up sports car, that can go from zero to 100 in the blink of an eye. He’s a tightly wound, explosive bundle of power, yet could blow a rod or a piston in an instant. You get the idea. But Cal isn’t just about their running backs. Here’s a look at the rest of the story. QB Controversy: Kind of weird to even think it from an outsider point of view, but there is a QB situation developing at Cal. A couple of years ago Nate Longshore was Mr. Everything, but now? Not so much. If you remember, Cal crashed and burned down the stretch last season, going from a near-#1 ranking to losing 6 of their last 7 games. They did rally to beat Air Force in the Armed Forces Helicopter bowl, 42-36. And that’s part of the controversy here. QB Kevin Riley (pictured) played outstanding football that day, finishing with a ridiculous 255+ QB rating. He only had 3 incomplete passes the entire game. Meanwhile Longshore’s struggles down the stretch matched the team-wide funk as Cal nearly missed out on a bowl game. Hard to believe this was the same team that beat Tennessee and Oregon earlier in the season, compared to the group that was steamrolled at UW and lost to Stanford to close the season. 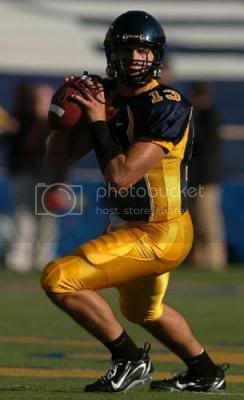 Longshore only threw for 2500 yards and 16 TD’s. That’s down from over 3,000 yards and 24 TD passes in 2006. Much, much more was expected of him last year. To be fair, Longshore was playing hurt for much of the season, so he never was quite himself. But there is some momentum behind the idea of the fans believing that maybe Riley is the answer. Right now, Jeff Tedford hasn’t fully declared either guy the starter, so, the door is open for Riley. Young Defense: 7 starters are set to return on defense next year, and it was a young defense at that. FS Thomas DeCoud and his 116 tackles are gone, but there is still hope. Zack Follett is back at strongside LB and should be on a lot of all-conference lists. He had 64 tackles last year, but a fantastic 12.5 tackles for loss, tops on the team. Corner Syd’Quan Thompson (pictured) looks like a real player, as he moved from WR to corner last year and tore it up as a sophomore. He had 78 tackles, including an impressive 6 for loss. He also had a team-high 10 pass-breakups. Bottom Line: Cal is in the middle of a real change-over on offense. Tons of new faces at the skill positions, and a QB situation that can best be called unsettled right now. If Best is healthy, early on you may see them keep things conservative as they break in the new guys in the first few games. Defensively I think they are going to be pretty good, and with those 7 starters back, they should help keep things under control while the offense settles in. That said, you have to wonder about their state of mind. Even with all their offensive firepower last year, they fell apart down the stretch in epic proportions. But who knows, maybe losing the star power from last year’s team is actually a good thing in their view. It might help heal the wounds from ’07, and they can more or less reboot and forget the collapse. They open with Michigan State at home, and then it’s on to Pullman. We haven’t beaten Cal since the 2002 Rose Bowl season, and their pure talent will always outshine ours on paper. But Tedford’s offense is sort of a west-coast hybrid, and timing is key in an offense like that. Early in 2008 might be the best time to play them, especially since it will be their first road game of the season. Cal will most likely be favored, but there could be an “upset alert” feel to this one. You are currently browsing the archives for the Jeff Tedford category.